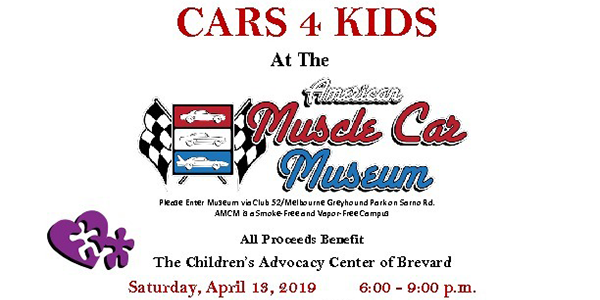 Please Join The Friends of the Children’s Advocacy Center of Brevard (CACB) At this fundraising event to benefit the Children’s Advocacy Center of Brevard, hosted by local car enthusiast Mark Pieloch at the American Muscle Car Museum (AMCM). Saturday, April 13, 2019 6:00 – 9:00 p.m.
See the Fabulous Car Collection of over 250 American Muscle Car classics from the 1950’s to the 1970’s to the modern “755 hp” 2019 Corvette ZR1 Convertible. Enjoy Delicious Food, Beer, Wine, & Soft Drinks, Live Auction, and Prizes! The Friends of the CACB will raffle a fabulous 2019 Toyota Camry SE. The winning Ticket will be drawn by hand during the CARS 4 KIDS fundraising event at the American Muscle Car Museum. Need not be present to win. Must be 18 or older to participate. No Cash Value. Winner is responsible for all taxes, tag, license and registration fees. The car pictured is an example of car being raffled. Winner may upgrade at own expense based on any increase over MSRP of auction vehicle ($26,713) to MSRP of potential upgrade vehicle. Odds of winning are determined by the number of tickets sold. No Purchase or contribution is necessary. The Advocacy Center is a collaborative effort of the Child Protection Team of Brevard, the Florida Department of Children and Families, the Office of the State Attorney, the Brevard County Sheriff’s Office, and municipal law enforcement agencies in Brevard County to investigate child abuse, protect children and hold offenders accountable. In fiscal year 2018, there were over 1,500 child abuse assessments completed at the Advocacy Center. A program of the Space Coast Health Foundation, the Children’s Advocacy Center of Brevard, follows a national model that that has proven to be successful in addressing the issue of child abuse and neglect. The Children’s Advocacy Center is specifically designed to provide a safe place for child victims of abuse, a child friendly environment where caring professionals coordinate child abuse investigations, complete abuse assessments and counselors provide specialized therapy for child victims of abuse. Admission tickets for the CARS 4 KIDS event at the American Muscle Care Museum are sold separately. Sponsorship Opportunities available.